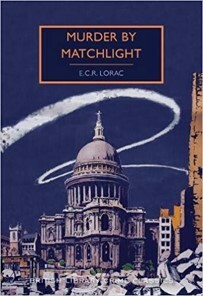 Murder By Matchlight is set in early 1944, and although the approach of D-Day is not mentioned, the backdrop of the Second World War is important to the murderer’s motive. It’s specifically the blackout in which the original murder takes place, and the general background in which Lorac’s Inspector Macdonald does his work. At least one of Lorac’s interviews starts in a boarding house and moves into an air-raid shelter as the bombings continue. No wonder one young lady resident says of the explosions and the anti-aircraft fire, “I do wish they’d leave off. I’m fed up with it”. In one of those wonderful overheard conversations (that inspire many thrillers); two different characters hear a third planned meeting, in what will be a pitch-black public park, and both decide to go along to observe what happens. In darkness, the victim appears and waits, then in a short flash of light a strange face – the murderers’ – is seen, and the victim slumps dead, killed in near silence. One witness holds the other, and calls for the police. Macdonald, going to the victim’s home address, finds that he was a chancer, a small-time spiv, and shortly after, someone who has been impersonating another is killed. Lorac is rather good at portraying boarding-houses, landladies and their charivari of residents, particularly as many of these boarders are “on the boards” (performing theatrically in what were ‘variety-shows’); though the young lady resident thinks “They’re awful people – really common”. You might start to think of knife throwers and bullet catchers, but Lorac is too good to go for such obvious suspects, and a surprise comes in the connection between the basement storeroom of the house, and the murder method. Relationships, from the past, from blood and from marriage, begin to show up, so Macdonald is forced to think about dates, age and appearance. Lorac here also begins one of her post-war themes, the trustworthiness of the soldier, which will become a theme in her post-war books. For now, the question is, what would a loving son in the commandos do for his parents, someone who has been trained to kill in silence. That, though, is only a small element in the blackout through which Macdonald has to see his way to find a solution. At the end I paused, realising that a lot of people had died in this book. They were the residents of the south London street killed in the blitz of 1940 – one of whom had his identity stolen by the murder victim. Macdonald was never going to bring their killers to justice; no one ever has.